BRIEF: The client’s children had both left home and she wanted to update her house to reflect her new lifestyle. She chose an interior designer whose look she loved. The art needed to work with the new interiors that the designer was creating, but they also needed to be interesting, beautifully made and reflect a personal story and aesthetic close to the client’s heart. This, after all, was her new solo palace. PLAN: The new furnishings are grey and off-white with touches of gold and sparkles of glass. The walls are gray, light pewter and soft green. The gardens reflect natural light into the house. There is an overall sophisticated, understated and feminine feel to the house. Art should be materials and process based. It must reflect quality and taste. PROCESS: FAM's design services included a custom menu of art selections presented digitally, complemented by a presentation of original fine art and samples of art to support the objective. Professional project management services included that commissions and framing be produced to exact specifications and meet the desired completion date. The receipt of shipments, installation supervision and professional security installation were overseen by a FAM team member. 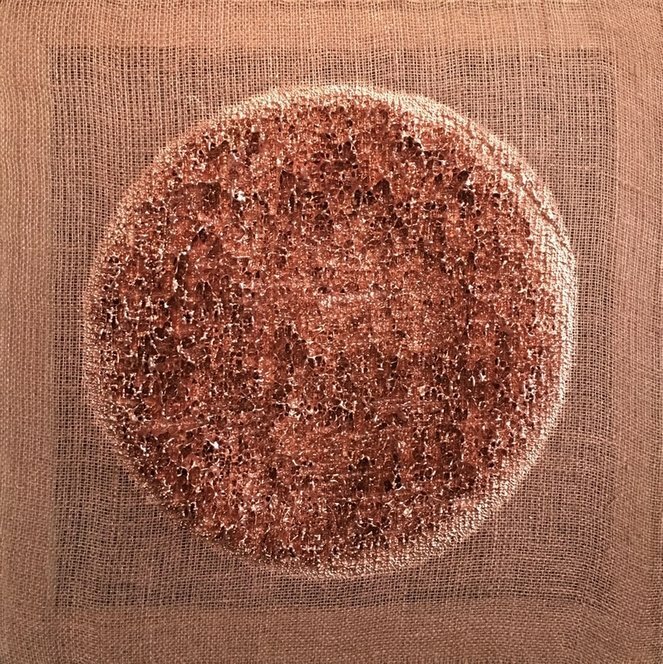 Silver Plating on Distressed Burlap, Layers of Resin and incising on Metal, Oil Enamel and Patina on Bronze, Acrylic on Bronze Mesh, Stoneware and Metal, Recycled Books and Gold Leaf, all come together to tell a story of interesting materials. Use of Wall Sculpture allows framing to be kept to a minimum. Where framing is used, it is custom and carefully chosen to work with the art and the interior. The objective of elegant feminine sophistication for a professional woman are beautifully met with the finished pieces of art. A clear example are the books used in the wall piece for the den. The re-purposed pages are from texts that the client chose. The art works presented by FAM and chosen by the client and her designer work seamlessly with the interiors. The art was all custom commissions and reflects the client's personal taste. Simple sophistication and sparing use of color mean the interiors work as a whole. The client is overjoyed with her new space and loves her new art! Testimonial: "You have helped me make my house so personal and so beautiful to me! Thank you for taking it on!!!" BRIEF: The hospital is a not-for-profit, regional Medical Center dedicated to providing high quality, cost effective health care services to their residents. The Medical Center offers a full range of services from local primary acute care to highly specialized regional services. Basic to the mission is a commitment to continuously strive to improve the status of health by reaching out and serving the needs of a diverse ethnic, religious and cultural community. The Medical Center provides the surrounding community with access to state-of-the-art technology, access to valuable wellness education programs and plays an active role in helping individuals maintain a healthy lifestyle. PLAN: The art reflects the natural environment. Large scale nature photography is printed on an art grade aluminum substrate. No wood is used in the framing, mounting, hanging or printing of the artwork. The placement is in the main floor of the Radiology and Lab Corridors. The hallways are long and the art helps to provide a pleasing distraction and a healthy perception of nature as people walk or are taken to their destinations. The ceilings are low so the art creates an expansive feel. PROCESS: FAM provided a custom menu of art design services including, the art selections presented digitally, complemented by a presentation of original fine art to support the objective. Professional project management services included that commissions and framing be produced to exact specifications and meet the desired completion date. The receipt of shipments, installation supervision and professional security installation were overseen by a FAM team member. All original fine art photography of nature subjects printed on an art grade aluminum substrate. Aluminum box frames on the back of each piece gives 1.25"D offset from the wall. No wood is used. Directions for easy anti-bacterial upkeep of the art is provided. Artwork is security installed with unique hardware that aids in the quick installation of a deep stand-off frame. 6 artists and 3 publishers provided FAM with high res files sized to print. Artwork is all original fine art photography and not mass-produced. It has a sophisticated feel and shows that care and time was taken in picking the art so that the visitors and patients feel that they are cared for, well taken care of and have peaceful, visual inspirational places to go. The Art reflects the local area, provides a soothing atmosphere and has no wood to meet the client’s objective. Clean, sophisticated presentation without framing has a modern appeal. The client is very happy with their finished interior. These beautiful new photos by one of our favorite photographers will create stunning impact. They are wonderful on a big wall. Printed large as a series these pieces can fill a space in a powerful way. Perfect over a furniture grouping, on a focal area wall or in a corridor with long hallways. Printing them on cutting edge substrates with minimal framing provides a modern, clean look. Contact us today to learn more! Click on the details below to see the full image. 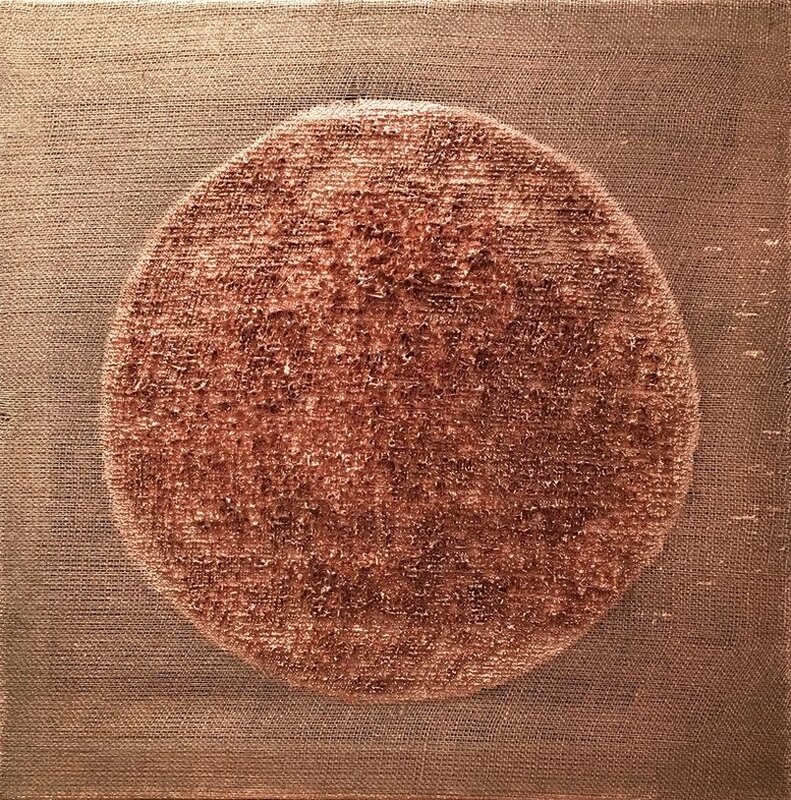 Incredible textures are created by enameling and copper plating plaster, on burlap. Check out the images below. In his words: My inspirations and visions derive from my personal heritage that is intimately involved with both pre-Columbian gold and shamanism. This gives me the impetus to create, in the belief that the glitter of metals is more than mere reflections, more than optically perceived phenomena. Moving away from the traditional two dimensional painting, the findings allow me to codify and translate my work into a new metaphysics of the "painted surface" and toward a new form of abstraction. 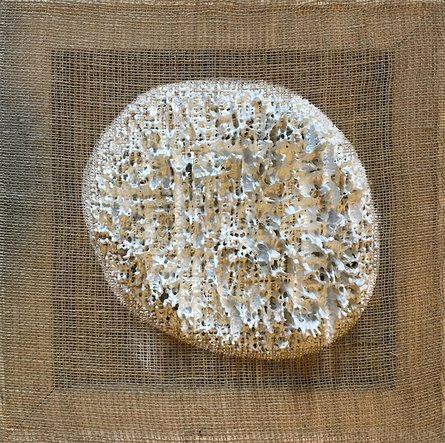 This abstraction is embodied on different processes such as tearing and hand stitching canvas or by forcing plaster to burlap fabric. Light, shadows and an infinity of scintillations emerge to become then, the subject matter of the new relief-like works. The works evoke then an incredible sense of light, space, movement and time. 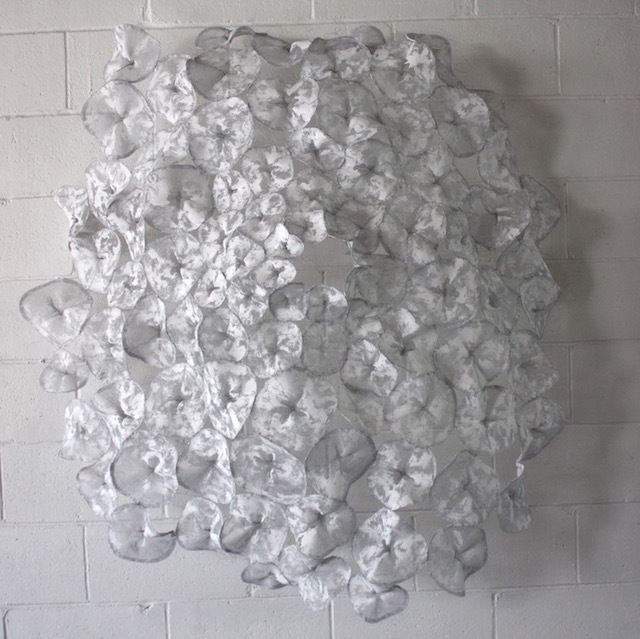 My key elements in art are plaster, metallic plated paints and thread. My aspiration is to transmit a magical and fertilizing energy to humanity through my works and to follow my passion for artistic possibilities in contemporary art. There are so many exhibitions and events to inspire ourselves with at the Getty this month. I want to highlight four. Take a look and see what inspires you http://www.getty.edu/egetty/e-getty.html. 'The Sculptural Line'; 'Breaking News: Turning the Lens on Mass Media'; In Focus: Jane and Louise Wilson's Sealander'; 'Bouchardon and Charles Ray: Sculptors Past and Present. See you at the Getty! Modernism Week in Palm Springs ended last weekend and Desert X began. I was lucky to hear 3 lectures at the PS Art Museum, during the first weekend of Modernism and visited ART PALM SPRINGS, February 16-19, 2017 at the Palm Springs Convention Center. DesertX is now on my calendar as a must see event. Museum quality artists like Los Angeles artist Lita Albuquerque and Jeffrey Gibson, Phillip K. Smith III and Rob Pruitt and with Artistic Director Neville Wakefield, I am convinced this will be an unforgettable experience. DesertX is a free contemporary art show that spans about 45 miles of the Coachella Valley. There will be indoor and outdoor pieces staged on public and private lands. Start at the Ace Hotel and get a map for a self-guided tour. The art is intentionally not clustered together. Februrary 25 - Saturday April 30. Info: desertx.org. Our new postcard will be in the mail in a few weeks! January features a recently completed residential project in Encino. Original Fine Art Photography Recently Sold to a Medical Clinic. Check here for news and updates on our latest projects...Click on our Contact page to sign up to receive our monthly updates! Murals, Wall Tattoos and More!